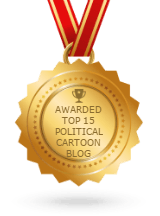 Pat Robertson today, on his 700 Club TV show, declared that he and his followers had saved the Republican National Convention in Tampa Bay, Florida. If not for their strong efforts to “pray away the gay,” he said, Hurricane Isaac would surely have destroyed the city with biblical force. 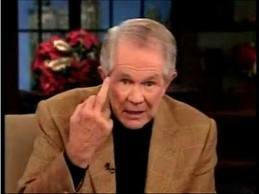 Pat Robertson gives the holy finger to gays everywhere. Pat Robertson is infamous for his many pronunciations about gays and sinners bringing natural disasters and terrorist attacks on themselves and the nation, all because God does not approve of their behavior. “Yea, God Almighty spoke to me. And the Lord said to ask you: Just who do you think creates the weather? The Lord God above, that’s who,” said Falwell’s ghost.